‘Skull with a Burning Cigarette’, by Vincent van Gogh. Could the Great Plague of the 14th century be the reason so many people today suffer from tobacco addiction? …he was never whipped so much in his life as he was one morning for not smoaking.1)Reported of Tom Rogers, 17th century student at Eton College Lyte, Henry Churchill-Maxwell. A History of Eton College, 1440-1884. Macmillan, 1889. In 1347 a ship arrived in the Sicilian port of Messina with an exotic cargo: the Black Death. It ripped through Europe, and took the lives of anywhere between 75M and 200M people. In some cities it felled three quarters of the population. Bubonic plague was the cause of the Black Death in the 14th century and it directly caused, or was a factor in, political, social, economic, scientific and philosophical upheavals, many of which influence us today. For instance, as so many people died from the Plague, their wealth and other possessions passed to their heirs, who grew wealthier. A shortage of craftsmen meant a rise in real wages for survivors. Meanwhile, fewer consumers, and the surpluses available from larger farms accruing to fewer farmers, meant that food prices dropped. All of this meant that the lower classes grew in wealth. With time, that wealth produced more education, and more cultural and intellectual pursuits. Not all of the results of the Black Death were ultimately beneficial, however. Some blamed the Jews and other minorities for the disease, and this began a tradition of heightened xenophobia, and increased persecution of those who are different. Simultaneously, many fearful people were turning to piety and increased devotion to the Church. Together, that prejudice and religious fervor would eventually feed into the Inquisition. 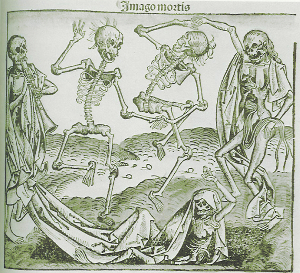 Death Dance: The Black Death. While many turned to piety, however, others turned to skepticism, and began to question all manner of authority. Their doubts included the effectiveness of religion. Despite unceasing prayers and much scholarly advice, the Church had been powerless to stop the pandemic. At least some of this skepticism fed into the Renaissance and the emergence of the scientific method. Others began to question royal prerogative, and their doubts about the Church led them to question the divine right of kings. Many of these critics emerged from the colleges of the great European universities. The words ‘college’ and ‘colleague’ come from the Latin con + lego, meaning ‘to rule together’. Unlike the modern American situation, in medieval Europe a college was a residence hall, where faculty and students lived together, and voted on their membership and governance. This quietly put down the foundations for democracy, and the emergence of the joint stock company and Protestantism in the 16th century further demonstrated the advantages of democratic approaches. Scholars disagree about the importance of the Plague on these intellectual and social upheavals. But it is interesting that the nexus of the Renaissance, Florence, was hit particularly hard by the pandemic. The Black Death struck with frightening speed. One day there was a tender area in the groin or armpit, the next day, the victim was dead. No one had any idea of the source of the disease. Today we know that fleas are the vector,2)What do you get when you cross a flea with a mountain climber? Nothing. You can’t cross a vector with a scalar. but in those days everyone lived with fleas, lice, and other vermin, and bacterial theory wouldn’t arrive for another 500 years. So the source was not obvious. People were willing to try almost anything to survive, and strange customs appeared. Some people thought that smoking kept the Plague away, and the boys at Eton were required to smoke. Hence the opening quote, above. 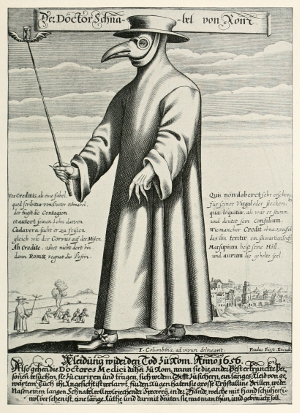 Dr. Schnabel, the Plague doctor. Ring around the rosy,3)Red swollen lymph glands were called ‘buboes’, from which we get the words ‘bobo’ and ‘bubonic’. The ‘posies’ refer to the custom of keeping flowers during the Black Death, and burying the dead with them. Note the Plague physician Dr. Schnabel here. The beak of his mask is designed to hold fragrant oils or flowers. Some people believed smoking would prevent the Black Death; others believed that sweet-smelling flowers, oils, and waters provided safety. The aromatic waters from eastern Europe – ‘Hungary waters’ – became popular at that time. A few centuries later, some of the best scented waters were produced in the German city of Köln. Or as the French call the city, Cologne. So the medievals thought that tobacco and sweet smells would keep the Black Death away. Very amusing. Or perhaps not. Many people suffer from tobacco addiction. When biologists see something that is common but which seems to be a harmful trait, she asks if there might not be some hidden advantage. Perhaps tobacco addiction is one of those. When I was working on my research on sexual selection, specifically the floral preferences of pollinators, at one point I needed a way to safely pick up honeybees and move them. I didn’t want to invest in a bee smoker, and hit upon the idea of using a cigar. I would walk around the greenhouse with a lit cheroot, and blow smoke on the bees to quiet them. It worked. They became calm, and some even went to sleep. Some of them, however, never woke up. Nicotine is a chemical that acts at nerve connections. Early physiologists used tobacco extract to investigate the interactions of nerves and muscles, and found that some systems respond to nicotine, others do not; in modern medicine we still classify some nerve-muscle interactions as ‘nicotinic’. In the appropriate systems, a small dose of nicotine causes mild stimulation to nerves and muscles. A high dose, however, can cause a toxic, runaway, even lethal effect. Which is what happened to some of my bees. Similarly, almost all perfumes and other ‘sweet’ smells are also highly toxic, aromatic4)In chemistry, ‘aromatic’ refers to compounds which contain a toxic benzene ring, or similar structure. substances. You’ve probably wondered why gasoline and many poisonous solvents have somewhat attractive smells. Turns out that, like nicotine, aromatic compounds are pretty good insecticides. Even the ancients knew that lavender and cedar wood kept moths and other insects away. One of the first principles of pharmacology is, “It’s not the drug, but the dose that makes the poison.” Most of our useful modern medicines are deadly in high doses. In low doses, however, they treat the disease while minimally harming the patient. This principle also applies to many insect repellents and insecticides. We put toxic chemicals on our skin; the amount used is very small for a large human being, but the local dose for a tiny insect can be lethal. As we noted, the Plague is transmitted by fleas. I don’t know if any research has been done on this, but I would wager good money that if fleas were offered two people to jump on to, and only one of them smelled of tobacco smoke and/or perfume, the fleas would more often choose the other. And if they chose the person with tobacco smoke or aromatic compounds on their skin or clothing, it would not be surprising if the fleas often died from the toxins. So tobacco addiction might be a helpful problem to have. A number of insects transmit disease. The Romans identified a deadly fever that was often contracted in the swamps. They thought the disease was caused by the hot and humid atmosphere, by the ‘bad air’ – mal-aria. Today we know that malaria is caused by a parasite smaller than a human cell, which is transmitted by mosquitoes.5)In the United States it is generally taught that Walter Reed was the man who discovered the role of mosquitoes in the disease. In fact, Reed learned of it from Cuban Carlos Finlay. Two other men, however, won the Nobel Prize for it. Tobacco addiction, of course, is a huge health problem today. And many solvents and perfumes also cause serious illness. But in low doses, they aren’t as dangerous as the Black Death or malaria. So you can see how in centuries past, those with a tobacco attraction, or even a tobacco addiction, and/or a preference for toxic aromatics, would collect higher doses of these on their bodies and their clothing, might survive more often, and leave more offspring. This goes to a couple of the themes of this blog. 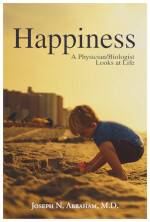 First, our behavior can be influenced by genetics; and second, we need to understand small evolution, the sort of biological change that is acceptable to both creationists and Darwinists. That is important because as the world accelerates, we need to recognize behaviors that served us in the past, but which may not serve us any more. Anyway, think about this next time you see someone smoking, or when you put on perfume or cologne. ‘Skull with a Burning Cigarette’ courtesy of Wikimedia.org. Dr. Schnabel courtesy of Wikipedia.org. Death Dance courtesy of ILab.org, from the 1493 Liber Chronicarum. 1. ↑ Reported of Tom Rogers, 17th century student at Eton College Lyte, Henry Churchill-Maxwell. A History of Eton College, 1440-1884. Macmillan, 1889. 2. ↑ What do you get when you cross a flea with a mountain climber? Nothing. You can’t cross a vector with a scalar. 3. ↑ Red swollen lymph glands were called ‘buboes’, from which we get the words ‘bobo’ and ‘bubonic’. 4. ↑ In chemistry, ‘aromatic’ refers to compounds which contain a toxic benzene ring, or similar structure. 5. ↑ In the United States it is generally taught that Walter Reed was the man who discovered the role of mosquitoes in the disease. In fact, Reed learned of it from Cuban Carlos Finlay. Two other men, however, won the Nobel Prize for it.